"Ciao amore, ciao my love, ciao amore, ciao and write to me"
The Yugoslav Final was held on March 23rd at the Universal Hall in Skopje, hosted by Marija Damjanovska. The winning song was chosen by the votes of 8 regional juries. The winning song was renamed "Ciao amore" for the ESC, where it came 18th. Izolda previously represented Yugoslavia in ESC 1982 as a member of the group Aska & was a backing singer for Yugoslavia in ESC 1983. Two members of the group Rendez-Vous (Bozidar Wolfand & Elizabeth Rhea) went to the ESC as backing singers for Izolda & Vlado. 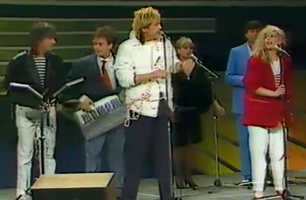 Eleonora Barudzija was a backing singer for Yugoslavia in ESC 1983.